The Albuquerque Public Schools are looking for a 19% property tax increase. At a cost of $1 million a special mail-in election will be held in early February of 2019. Anyone living in the district can vote. The thing is that it is hard to see how APS needs more of our money. Based on 2016/2017 school year data, APS spends a lot more money than other major school districts in neighboring states. We get the $16,000 plus figure by dividing the $1.34 billion annual budget by the number of students in the district (83,019 according to the most recent budget). 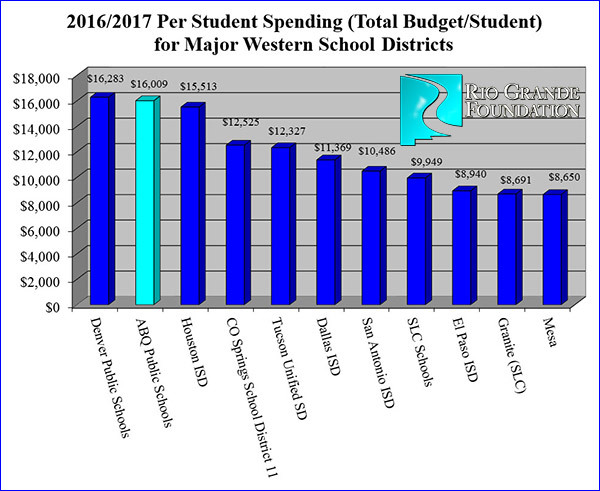 And, while property taxes are dedicated to capital outlay spending, it is worth noting that New Mexico schools as a whole spend much more per student than any other neighboring state. This calculation was made using data available from the National Education Association (yes, the union). This number came about from dividing capital expenditures (p. 58) by average daily attendance (p. 45). 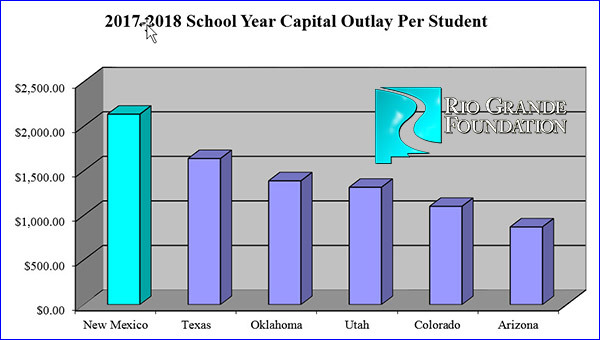 APS is by far the largest school district in New Mexico so it is likely that capital outlay expenses at APS track or even exceed those of New Mexico as a whole. Paul, you’re missing charts that show the Graduation Rates at these other school districts. Are they better or worse than APS, that’s the whole point. All I have are questions. Don’t take this the wrong way. I genuinely want to know what the RGF thinks. I’m not really clear on what’s going to be improved by raising property taxes by 19%. I think we all want to support education, but still, I want to know specifics. Out of a myriad of topics, perhaps we choose one.. the literacy rate. Whether someone can read, write, and follow directions is the first indication that someone can function and contribute to partaking in a community. From what I have read, 46% of NM adults operate on a level 2 or below out of scale of 5 (NM Coalition for Literacy). Which brings me to the question of where is the present 16k per pupil going? If money isn’t fixing it, what’s the answer? More money? Because obviously, if 16k isn’t doing it… is another $3200 per pupil going to make them more literate? Does it take 20k per pupil to bring them up to a level 4-5 on the Literacy Scale? So I wonder …is the lack of literacy for almost half of the state’s population due to poverty or education? Or is this like asking, which comes first –the chicken or the egg? How do we not link poverty, the lack of education, and a deficit of literacy together? Which again, begs the question -is a 19% property tax increase just for education, really going to bridge all the gaps? Of course, because it’s NM teachers who have also pointed out that our salaries are lower -I want to know by how much for other cities commensurate to our size and economy. But it also makes me wonder if we are recruiting only from UNM, or are we offering enough to attract teachers from other places. Not to be insulting, but if all someone knows is NM education and doesn’t have exposure to how things are done in other states with higher results, are there enough perspectives and input on what a quality learning experience looks like? You have said a mouthful in your statement and I won’t even try to answer all the questions. NM’s inherent education problems include poverty, high numbers of minority students, and the breakdown of the family/broader social ills. Those are drawbacks, but the schools themselves could do a much better job (and some in NM do). But there are inherent systemic issues in NM including a lack of accountability due to the passive political culture and the statewide funding formula which directs power to Santa Fe as opposed to local districts. NM also spends a disproportionate amount on capital projects already. Now, in terms of APS, they COULD use the money more efficiently, but they have interest groups and empires to satisfy. They spend money on administration and buildings, they don’t have any systems in place for attracting and retaining their best teachers or really even finding out who is indeed a high-performing teacher. The unions are in control of the district. I’d recommend you check out this article. We’re missing the point by assuming that the school district’s mission is to teach children to read and graduate productive citizens. APS exists to employ teachers and other union members. The presence of students is beside the point.